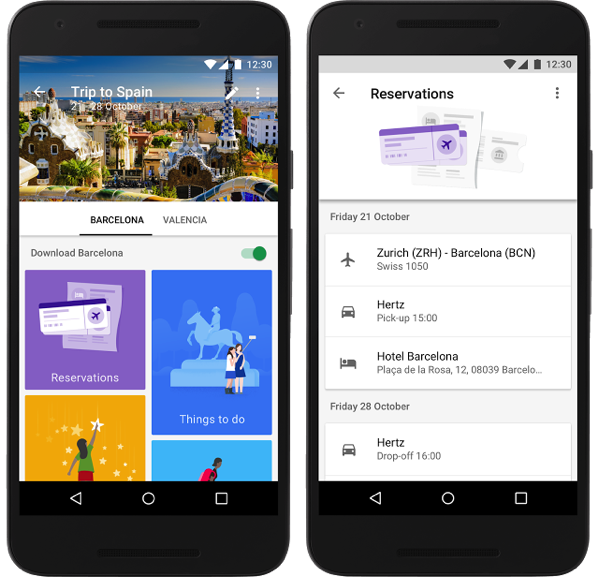 Google has today announced the launch of its new ‘Google Trips’ smartphone app, that promises to help travelers enjoy their hard-earned vacations. The app lets users instantly plan each day of their trip with just a few taps, and pulls in a combination of data from Google Maps and crowdsourced contributions from other travelers, in order to offer a personalised pocket travel guide, that also works offline. For the top 200 cities in the world, Google Trips shows you a variety of day plans featuring the most popular daily itineraries. We’ve automatically assembled the most popular sights, attractions, and local gems into a full day’s tour — all based on historic visits by other travelers. So for instance you’re visiting Barcelona, the app will let you select from multiple day plans, like “Eixample District,” which maps out the can’t-miss buildings by Antoni Gaudi, the famous Spanish architect. Say your friends told you that you have to see the Sagrada Familia, and you’re looking for suggestions on things to do around that spot, simply press the “+” button in the day plans tile to jump into a map view containing all the top attractions in your destination. The app also lets you keep track of all your flight, hotel, car and restaurant reservations. All your travel reservations are automatically gathered from Gmail and organized for you into individual trips, so you don’t have to search and dig up those emails.